The Pride of West Virginia is one of the best college band programs in the country and every year hundreds of students try out for the band hoping to achieve a life long dream. Typically if you make the band your marching career ends after four years or in some cases 5 or 6. You graduate and enter into the ranks of alumni band and come back once a year to relive the glory days during homecoming. One member of the Pride of WVU just simply can't get enough band. 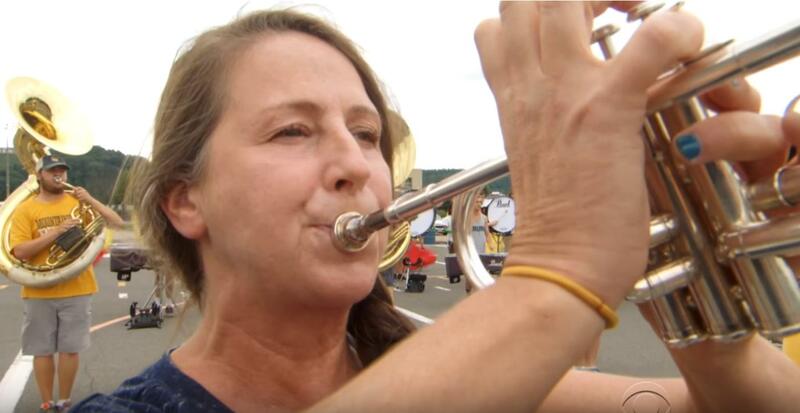 At 52-years-old, she is the oldest member of the band and has no plans of joining alumni band any time soon. West is a reading teacher and for the last 35 years she has marched in the Pride of West Virginia in the trumpet section. She just couldn't give it up. In fact for years she took classes just so she could qualify to be a member in the band. Now the university allows her to just take band and she sets the tone for energy at practice.